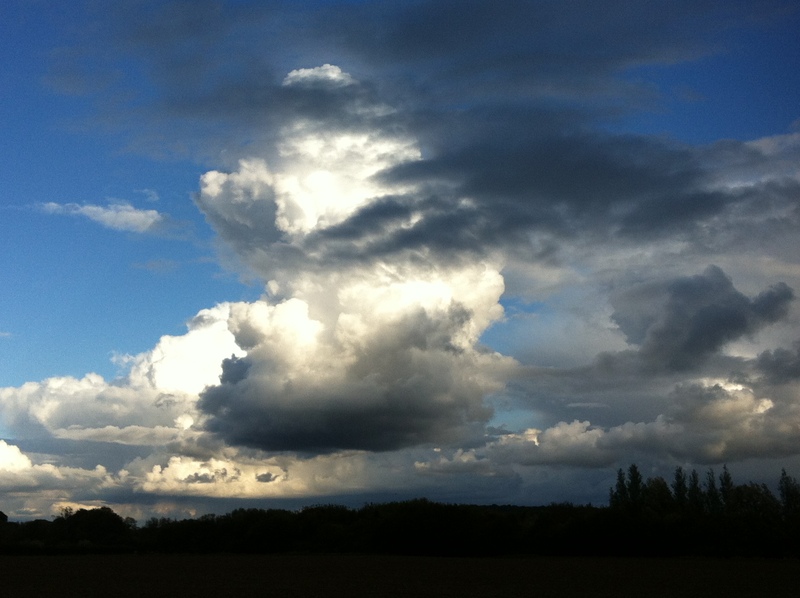 Took some photos of AMAZING clouds the other day…the light is so clear and crisp at this time of the year. I think it’s an equinox thing. 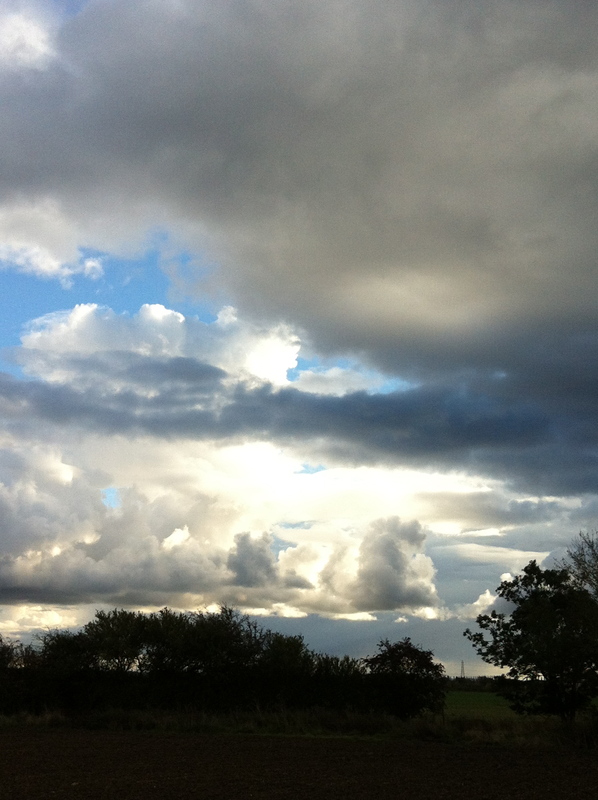 The light seems to be clearer and crisper in Autumn and Spring. Sharp is probably a better word. Sharp light. Sitting in my studio the other day before I took these photos, I needed a break from grappling with a painting. 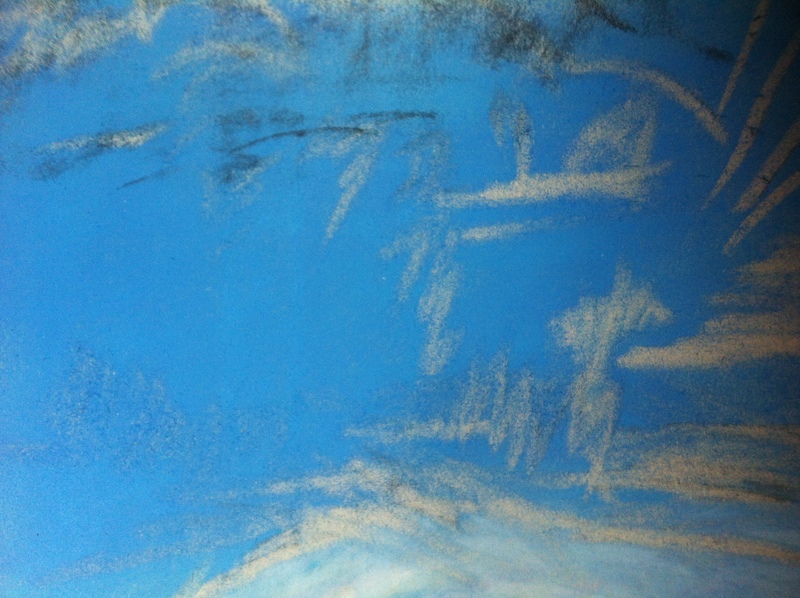 I tore some squares of sugar paper and started drawing what I could see of the sky from my studio windows. I just used blue pastels, pencil and charcoal. I haven’t done this for ages. I felt like an art student again. 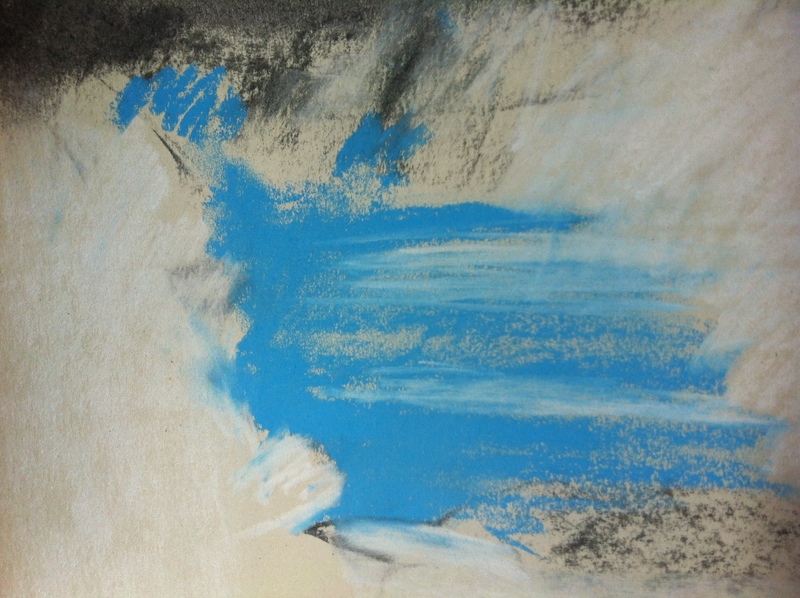 This is where I started…being outside, drawing and painting what I could see and feel of the sea, the sky, the land. I just love it! The act of mark making (drawing), tearing, sticking and painting in response to inspirational nature…that’s what going on here at the moment. I am very tuned into colour combinations and the effects of light in nature and I am also aware of the way these influence my work. I know that often I will be awestruck by something I see and intentionally use that in the colours I choose to paint with. However, sometimes I think it comes out subconsciously. 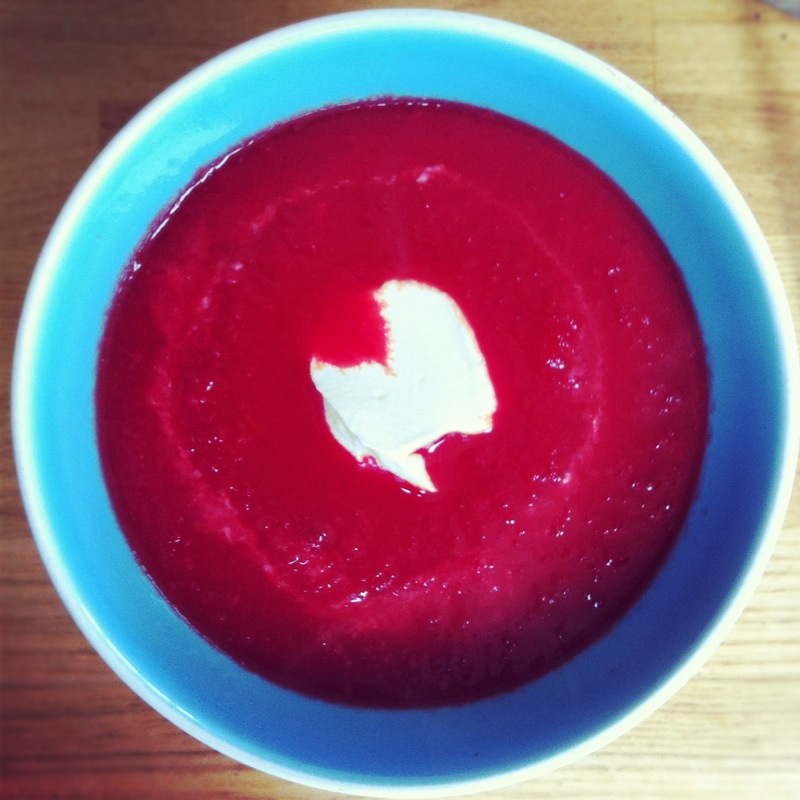 A friend of mine recently stayed with me and she cooked a delicious and stunning coloured beetroot soup to which we added creme fraiche as a swirl in the middle! Mine was in a turquoise bowl…. I hadn’t thought twice about the beetroot soup since our delicious lunch but by sheer coincidence, I happened to see the two photographs side by side and the relationship between the soup colours and the painting was obvious. It’s as if our brains move bits of information from one place to another. It receives info which is stored in various different places and then we draw from these when we need to. Obvious really! 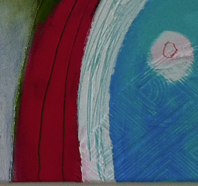 However…..in a very recent painting, I hit a sticking point. It needed something dramatic to lift it. I had been working in various blue hues and tones. (I’ve been allowing myself to indulge in my compulsion to use turquiose recently, I think it could be because it is such a positive colour and helps to compensate for the lack of blue sky this year!) As I looked at it, listened to my intuition and tapped into the mysterious source of creativity, ‘red’ plopped into my mind. 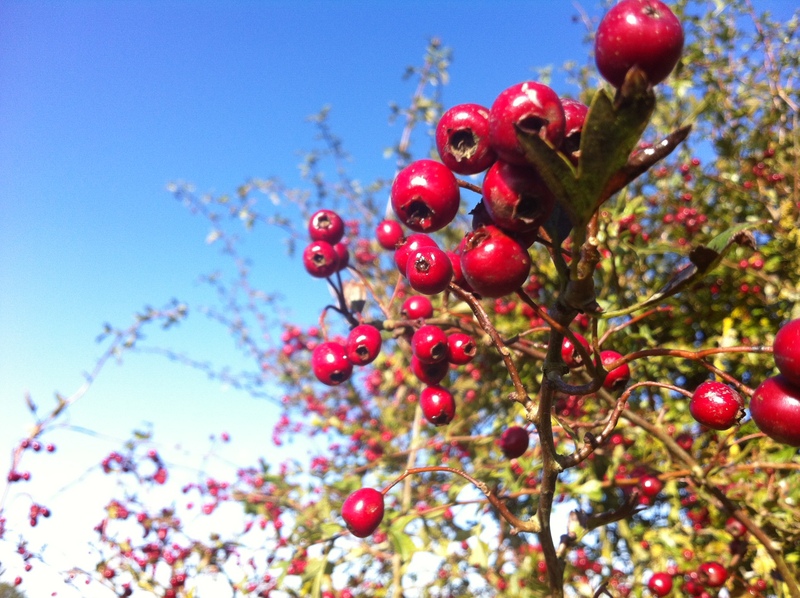 Bright red, a mixture of cadmium and crimson. Crimson on its own was too ‘blue’ and cadmium too ‘orange’. It had to be bang in the middle of the two. I was pleased with the result. It was just what the painting needed. It just got me thinking about the cycle of influence on our creativity….sometimes we notice things and it comes out in what we do and create and sometimes I think something beyond ourselves speaks to us directly and then we go out and notice it. 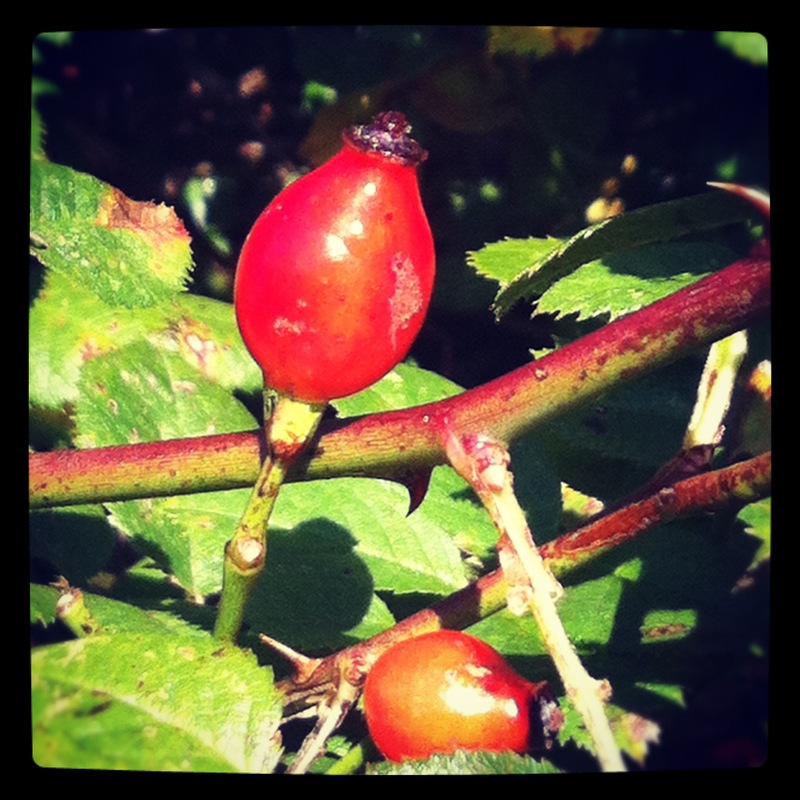 I think there must be more significance to this redness to be revealed….. Yesterday I used string, painted white, to make marks on my paintings. I love just ‘making marks’. Is this a primal instinct. I think it is. 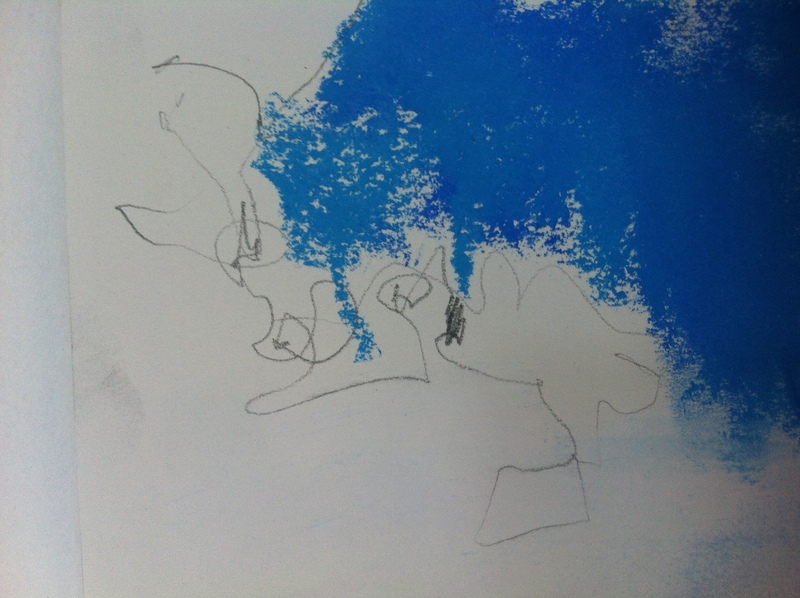 All children seem to want to draw or make marks in some way or another. Even using a stick in the sand is mark making. I’m enjoying using materials loosely so that some of the mark making is left to ‘chance’. I like the interplay between ‘control’ and nature’s laws. I remember being on a beach when my oldest son was about 3 or 4 and we invented a game where we picked up long strands of seaweed like bits of rubbery rope and threw them up into the air. We watched how they landed and picked them up carefully to see the mark this had left in the sand. Each one was different. I don’t know much about the mathematical laws which explain why this happens but we were hooked! 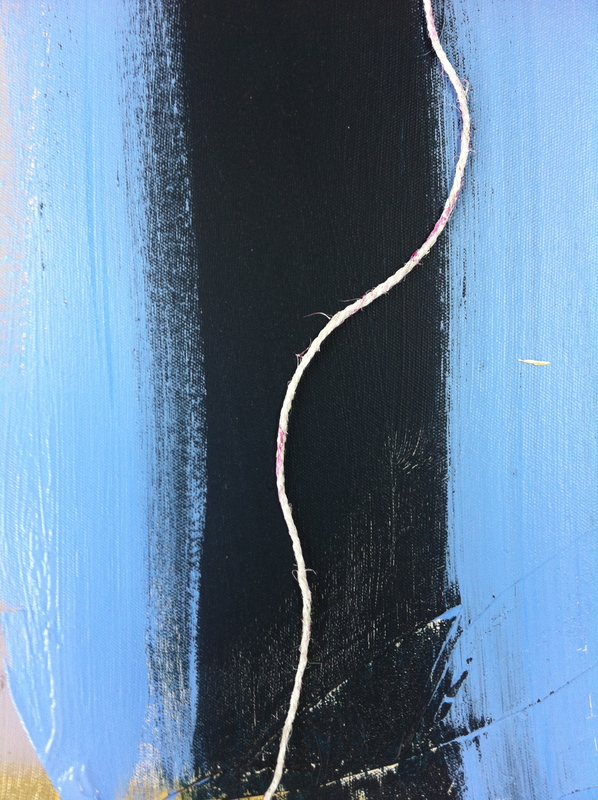 I started doing this on my paintings today, not with seaweed, with painted string…. I like the juxtaposition of the controlled with the ‘unconstrained’. I looked up the opposite of ‘controlled’ on google and came up with ‘slapdash’, ‘free’, ‘unconstrained’! Love what these words conjur up! I’m working on creating depth within the picture surface using freedom and control. So I’m an abstract painter…it’s hard to define what an abstract painting is. A series of shapes, colours, marks, gestures. Mine are a kind of record of the time they were done but also a spilling out of all the things that are recorded somewhere in my brain. 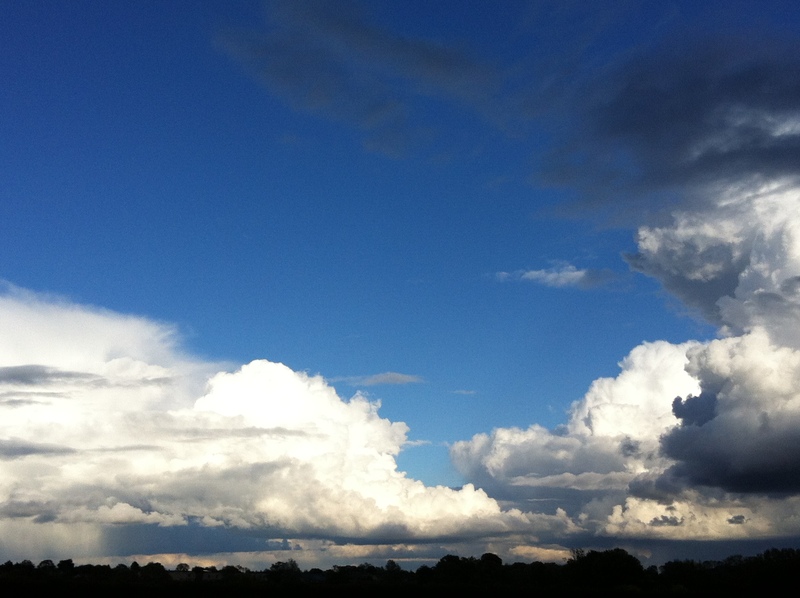 Often they resemble skies, landscapes, places to wander off to. I’ve realised recently that we really don’t use our imagination enough, us humans. I think it has far more potential than we are aware of. 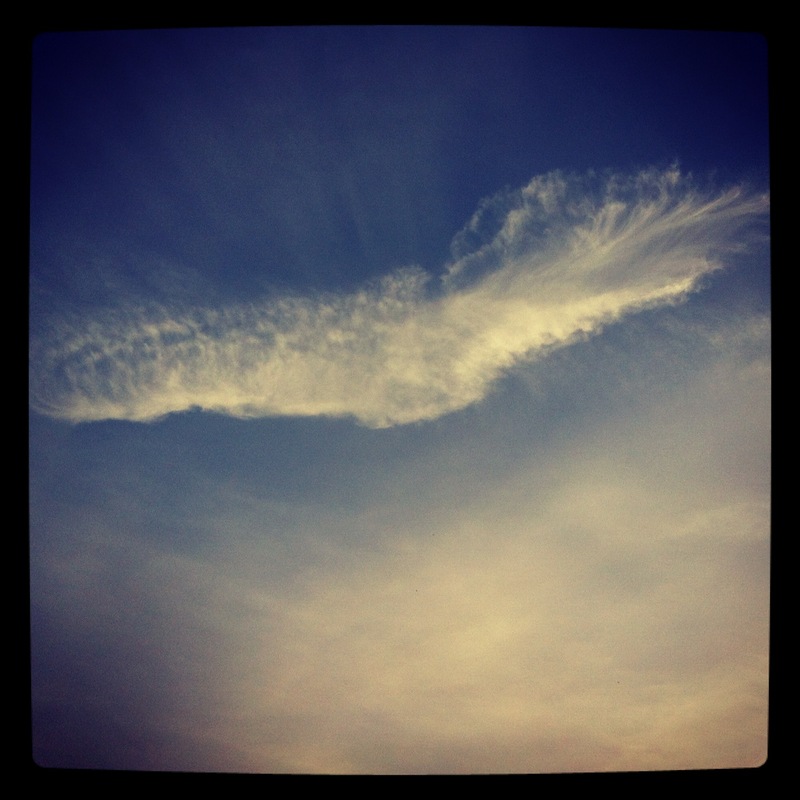 I guess with this in mind, I was reminded of the ‘ink-blot’ excercise and the way we have probably all at some point seen things in crumbly bits of plaster on the wall or cloud formations that look like animals and anything else you might care to suggest. My paintings often become kind of imaginary places or landscapes. I’m always aware of trying to create some kind of depth to the picture surface and a sense that there is something beyond….I would love to create work that becomes a stimulus for other people’s imagination, imaginary places for the imagination to explore and to explore itself! I’m getting back to colours, gestures, mark-making: primal instincts, letting go. Creating images, colours, to stimulate the imagination or provide rest or peace or excitement or wonder. Maybe contemplation and prayer. Visual stimulus for the soul perhaps.